"Why Is My Water Heater Knocking?" | AllTech Services, Inc. 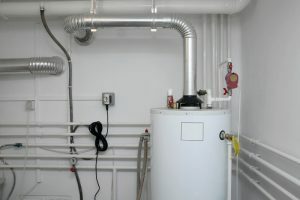 The knocking sound you hear coming from your water heater is most likely due to mineral deposits, or sediment, that’s gathered at the bottom of the tank. This is also known as sediment, and the sound is due to reduced water volume in the tank. This forces steam bubbles to rise as the burners heat the tank. The bubble becomes trapped and rattle around the sediment at the bottom of the tank, causing this knocking, popping, or even rattling sound. Scaling is most likely the cause of this noise, and can cause significant damage to your water heater tank—including but not limited to corrosion. Also, the knocking could potentially be coming from another source, such as water hammer in your plumbing pipes. Basically, if you hear this noise it’s time to call in a pro. Scaling is the result of hard water—water with an excess of minerals in it (namely calcium and magnesium). Hard water isn’t usually harmful to your health since the minerals involved are ions. They can, however, cause some major damage to your plumbing pipes and fixtures. Deposits get left behind in the bottom of the tank, which is made of metal but lined with a glass lining. The deposits rattling around at the bottom of the tank can wear down this lining, however, and force the tank to corrode. There’s no coming back from this type of damage, and you will need to replace your water heater. Some water heaters are stuck dealing with hard water throughout their lifespan. It doesn’t have to be this way, as you could have a whole-house water softener installed. However, if that’s not an option then you may need regular flushing of your tank in order to clear out any sediment that’s gathered at the bottom of the tank. While you can find video tutorials online explaining how to do this yourself, we recommend letting a technician do this during your annual plumbing maintenance session. This is particularly true if you have a gas-powered system due to chance—albeit rare—that you’ll run into a safety hazard. To get in touch with a professional plumber in Sterling, VA, look no further than AllTech Services, Inc. Contact us today!